Men who offer laudatory speeches to the rich ... carry fire to fire, when they shower pride upon pride, and heap on wealth, heavy by its own nature, the heavier burden of arrogance. 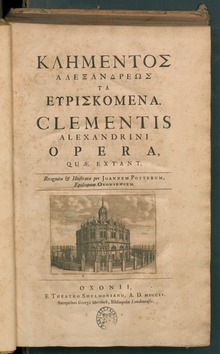 Titus Flavius Clemens (c. 150 – c. 215), known as Clement of Alexandria, was a Christian theologian who taught at the Catechetical School of Alexandria. Our whole life can go on in observation of the laws of nature, if we gain dominion over our desires from the beginning and if we do not kill, by various means of a perverse art, the human offspring, born according to the designs of divine providence; for these women who, in order to hide their immorality, use abortive drugs which expel the child completely dead, abort at the same time their own human feelings. As quoted in ''Noble Thoughts in Noble Language (1871) edited by Henry Southgate, p. 2. How can it not be necessary, for him who wishes to lay hold of the power of God, to philosophise and to grasp with comprehension intellectual concepts? We shall not err in alleging that all things necessary and profitable for life came to us from God, and that philosophy more especially was given to the Greeks, as a covenant peculiar to them, being, as it were, a stepping stone to the philosophy which is according to Christ. Οἱ μὲν τοὺς ἐγκωμιαστικοὺς λόγους τοῖς πλουσίοις δωροφοροῦντες ... ἀσεβεῖς μέν, ὅτι παρέντες αἰνεῖν καὶ δοξάζειν τὸν μόνον τέλειον καὶ ἀγαθὸν θεόν, ἐξ οὗ τὰ πάντα καὶ δι᾿ οὗ τὰ πάντα καὶ εἰς ὃν τὰ πάντα, περιάπτουσι τούτου τὸ γέρας ἀνθρώποις ἐν ἀσώτῳ καὶ βορβορώδει βίῳ κυλινδουμένοις καὶ τὸ κεφάλαιον ὑποκειμένοις τῇ κρίσει τοῦ θεοῦ. Men who offer laudatory speeches to the rich ... are impious, because, while neglecting to praise and glorify the only perfect and good God, from whom are all things and through whom are all things and to whom are all things, they invest with His prerogative men who are wallowing in a riotous and filthy life. δεῖ δὲ σαφῶς εἰδότας ὡς οὐδὲν ἀνθρωπίνως ὁ σωτήρ, ἀλλὰ πάντα θείᾳ σοφίᾳ καὶ μυστικῇ διδάσκει τοὺς ἑαυτοῦ, μὴ σαρκίνως ἀκροᾶσθαι τῶν λεγομένων, ἀλλὰ τὸν ἐν αὐτοῖς κεκρυμμένον νοῦν μετὰ τῆς ἀξίας ζητήσεως καὶ συνέσεως ἐρευνᾶν καὶ καταμανθάνειν. The sayings ... which are of importance for the whole end of salvation, and are enveloped in a wonderful and super-celestial depth of thought, should not be taken as they strike the careless ear, but with an effort of mind to reach the very spirit of the Saviour. Cultivate quietness in word, quietness in deed, likewise in speech and gait; and avoid impetuous eagerness, for then the mind will remain steady, and will not be agitated by your eagerness. ... For the mind, seated on high on a quiet throne looking intently towards God, must control the passions, ... so that your quietness may be adorned by good proportion and your bearing may appear something divine. Let everything you do be done for God, both deeds and words; and refer all that is yours to Christ; and constantly turn your soul to God; and lean your thought on the power of Christ. ... Let Christ be to you continual and unceasing joy.